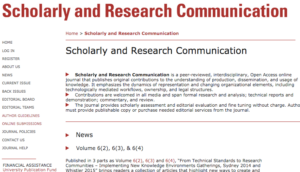 Glass’ article in Scholarly and Research Communications lays out the initial concepts and goals that later framed Social Paper, the marquee feature of Commons 1.9. Of first importance to SP is the facilitation of student “ownership” of the ongoing production of their academic writing. By “ownership,” I mean that students should have the security of knowing their data is not exposed to corporate data mining. Furthermore, writing should also be easily exportable into file formats necessary for submission to journals or conferences instead of locked into proprietary formats that make data unnecessarily time-consuming and difficult to export. Finally, students should have a centralized way of managing their writing. Instead of sharing or hosting writing on a variety of different networks, course blogs, and file formats – all with various levels of access, permissions, and social functionality – SP will enable graduate students to store all writing (from weekly course responses to final term papers) on their own personal site.